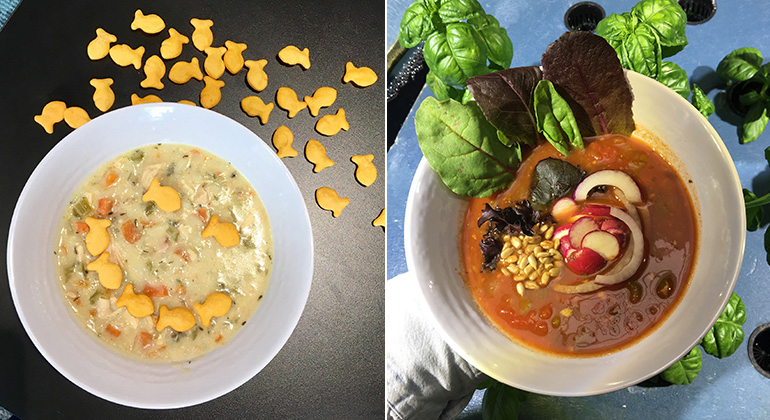 With blustery soup season just around the corner, it’s a smart idea to take stock of your soup toppers: could they be zestier, trendier or just more fun? How does the right crushed peppercorn, drizzle of fruity olive oil or brunoised pumpernickel crouton add to the overall experience of soup? And why not reverse the order of toppings and soup, pouring it on for a dramatic finish? To make a soup bar work in the time-crunched K-12 world, it takes a bit more creativity. 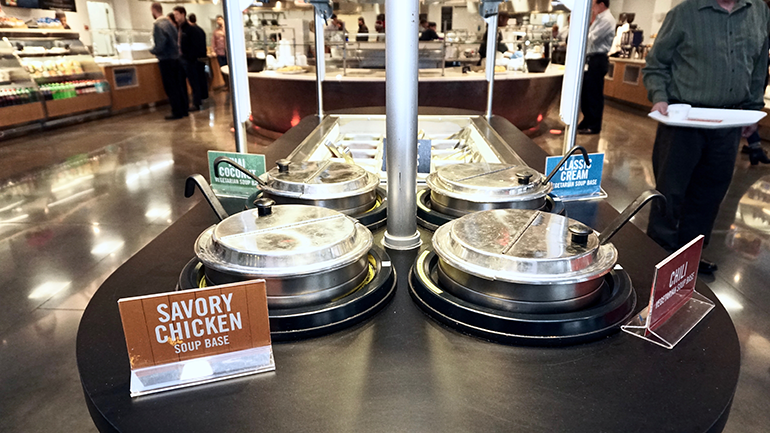 At Rosemount-Apple Valley-Eagan Public Schools in the Minneapolis area, the foodservice team has flipped the soup bar idea on its head to make fresh, hot soup happen quickly. 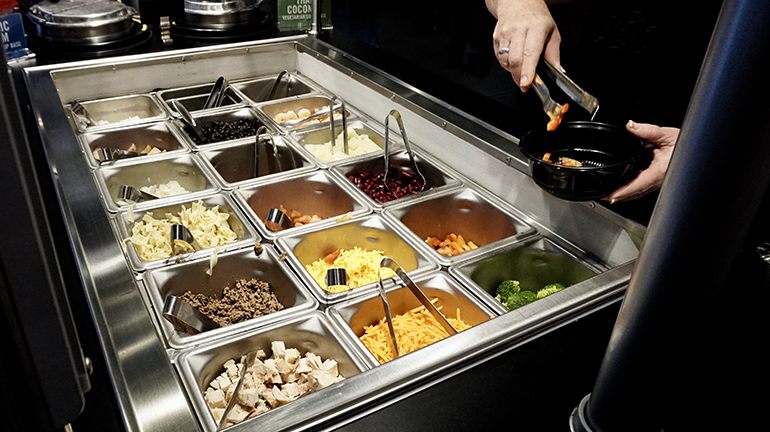 It works like this: Staff preassembles solid soup ingredients and toppings into 16-ounce black bowls with clear lids, which students can grab. These are kept cold in a special unit. Then, the student hands the bowl to a staff member, who pours broth or creamy soup on top. The soup is 190 degrees, which quickly warms up the cold ingredients. And voila! Soup in seconds. Teachers and kids appreciate the Soup Spot concept, choosing their own solid soup ingredients, then adding their choice of brothy or creamy soup liquid for a fresh, customized bowl. The district dietitians developed each soup to fit within National School Lunch regulations, and a complete meal can be achieved by adding a whole-grain bread or roll, for example. Fruit, veggies and milk are available further down the line. 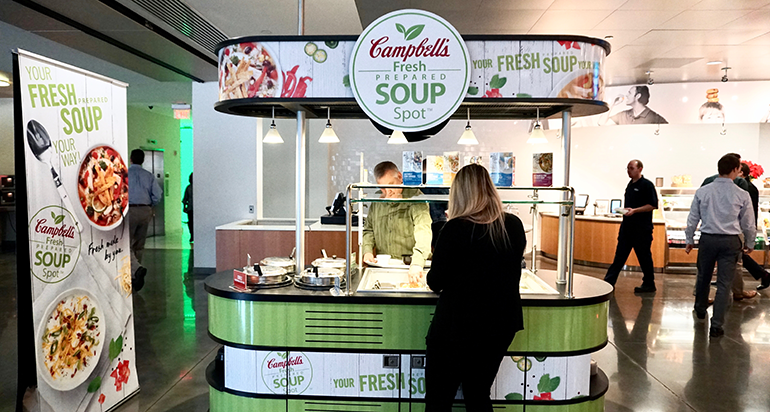 This soup bar is the first that Campbell Soup Co. rolled out at the K-12 level; similar setups have been popping up on college campuses for a couple of years now, with the all-in-one soup station that has both cold and hot wells. Another bonus has been the fact that teachers are craving the soup bar as well. New this year at Eagan High School in Minnesota, this soup bar is made for customization, with choices for the base including chicken broth, classic cream, chili and Thai coconut. During the fall and winter months, soup bars are a regular fixture at Liberty University in Lynchburg, Va. Over a four-week cycle, each day two soups are available (one brothy and one creamy), with appropriate toppings on the bar to match, going with a decidedly “the more the merrier” philosophy. “We like to have tons of toppings out there for them,” says Sarah Falls, CEC, CCA, district chef/campus chef with Sodexo at Liberty. The most popular soups with students have been classic favorites on the hearty side: loaded baked potato, creamy tomato and chicken tortilla. And the toppings that students love most include chives, bacon crumbles, shredded cheese, sour cream, corn bread, tortilla chips, croutons, fresh herbs, roasted corn, jalapeños and green onions. But Falls has also been branching out into more global soup selections, and toppings that are a little more unexpected: pea shoots, microgreens, wonton crisps, avocado slices, fried tofu, pumpkin seeds, avocado crema, garlic-cheese bread, roasted nuts, crostini, puff pastry strips and more. While soup toppers are the finishing touch to chefs, for customers, what’s on top of the soup is a first impression. From fancy to fun, creative soup garnishes are an upgrade that elevates a simple soup lunch to the next level: a satisfying meal. Different combinations of soup bases and solid ingredients mean endless soup possibilities. At the University of Southern California in downtown LA, soup season isn’t quite as blustery as it is elsewhere, but soup definitely has a place on the menu, especially coastal Cali-style seafood soups. Executive Chef Eric Ernest will sometimes use an ingredient of the soup as a garnish that provides a clue as to what’s inside, like a seared scallop or prawn. He’s also a big fan of acidic garnishes. Dukkah—a nutty, substantial spice blend with hazelnuts, sesame seeds, coriander, cumin, peppercorns and more—has been finding its way into several USC kitchens thanks to its flavor and crunch, another good idea to sprinkle onto soup, Ernest says. And sometimes, USC soup garnishes—especially at the fine-dining venues around campus—take to the fanciful side, with little boats made out of puff pastry or brioche piped full of goat cheese, but not so much that the “boat” will sink. A little fun can go a long way. Ithaca College adds a playful touch of goldfish crackers to Mindful chicken and rice soup by Sodexo (left). Ithaca also serves chili with kidney beans, sunflower seeds, basil, Swiss chard, radish and onion (right). And sometimes that “boat” can contain the makings of a meal, as in Restaurant Associates’ (RA) Simmers concept, which takes traditional dishes like chicken Parmesan or stir-fry dumplings, then pours soup around the components, creating a bit of lunch theater and ultimately a more substantial soup. Simmers was created last year by top RA chefs Tim Buma, Billy Strynkowski and Jesus Huarcaya, who wanted to take a low-cost item and turn it into a meal. The concept was ready to go at all RA locations this past winter-spring season, and it’s typically offered three to five days a week during soup season, with different soups. The attention to detail is impressive: The chicken Parmesan soup starts with slices of pre-cooked breaded chicken cutlets, shaved Parmesan, oven-blistered tomatoes, garlic bread crostini and leaves of fried basil. Hot tomato soup is poured on top. For the dumpling soup, kimchi, tofu, three types of mushroom get topped with garlic-chili vegetable broth. There’s even a lobster pot pie soup with hunks of lobster meat, potato, carrot, celery, pearl onion, peas, pastry and lobster bisque. Year-to-year soup sales data from RA show that this concept has soup success written all over it, showing that the tagline “Your favorite meal as a soup!” has definitely hit the mark with customers. 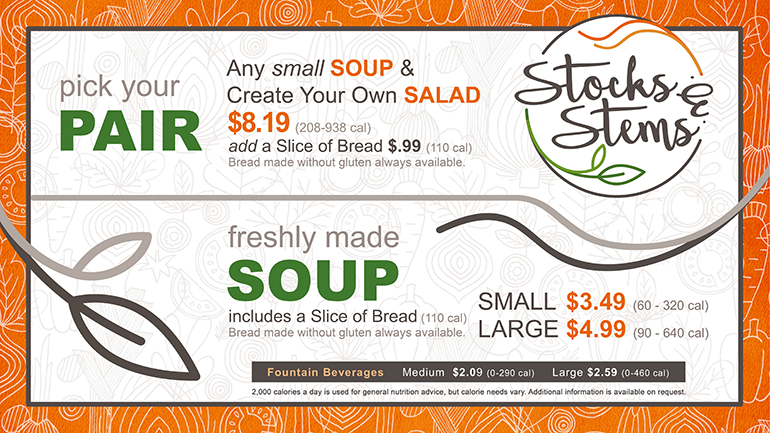 Taking a page out of Panera’s playbook, the University of Albany has found that customers love to mix and match soups and salads at the Stocks & Stems concept.